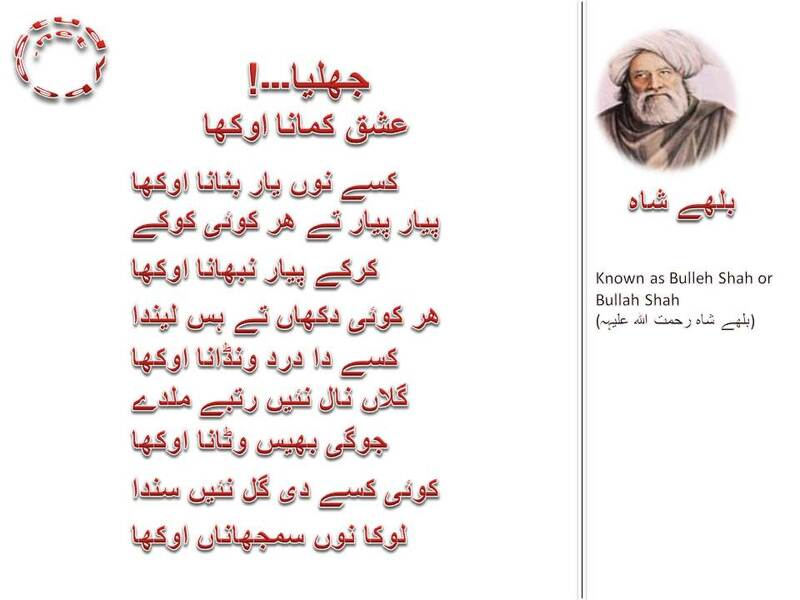 ‘Jhalya ishq kamana okha, kisay nun yar banana okha’ by Baba Bulleh Shah expresses thoughts on the subject of love; like all great thinkers and people of high moral stature, Bullah is also looking at love as a sacred and noble cause. All poets across the cultures value love as the most precious gem of human emotions. Bulleh Shah says “O fool, it is difficult to earn love” and it is not easier to woo your love. Everybody keeps uttering the words of love, but it is very difficult to stick firm to the relation of love once committed. Humans soon change their moods according to their circumstances and fall for compulsions. Bullah is in for true love which prevails upon souls and not body. There are several people in the world that are happy to laugh at the pains of others but it is difficult to share the pain and pangs of fellow human beings. Mere words cannot assure of high status, practicality is required for earning repute. It is very difficult to convince people.